Russian marines stormed a hijacked Russian oil tanker in the Gulf of Aden early Thursday, killing one of the Somali pirates aboard and capturing the remaining 10, officials said. The marines from the warship Marshal Shaposhnikov exchanged fire with the pirates aboard the Moscow University after speeding in small boats to the vessel and scaling its sides in an operation lasting over three hours. "The tanker was freed last night as a result of a successful armed operation by marines from the Marshal Shaposhnikov," a spokesman for the Russian foreign ministry told AFP. The tanker's operator Novoship said all 23 crew were unharmed. "All crew members are alive and well," the company said. Russian investigators said the 10 captured pirates would be brought to Moscow to face charges, adding that some had been wounded in the firefight and one killed. "The investigation is taking steps to transport the captured pirates to Moscow," the Investigative Committee of Russia's Prosecutor General Office said in a statement. It said the investigation will be conducted in accordance with Russian and international law and they will face "criminal responsibility" for the hijacking. Somali pirates seized control of the 230-metre (755 foot)-long Moscow University early Wednesday as it sailed out of the Gulf of Aden, setting up a high-seas standoff as the Marshal Shaposhnikov steamed to the rescue with a unit of marines on board. The tanker had been on its way to China from the Red Sea with 86,000 tonnes of crude oil, believed to be worth around 50 million dollars. Before storming the tanker, the warship's crew had used a helicopter to conduct reconnaissance, RIA-Novosti news agency quoted a high level naval source in the region as saying. "Simultaneously boats with an anti-terror group approached the tanker from the sea and boarded the vessel," the source said. "After a short fire-fight the pirates were neutralised." The crew had been locked into a cabin as the pirates took control of the vessel, the company said. The end to the 20-hour hijacking is a major triumph for the Russian navy and comes as the entire Russian military gears up for a massive parade on Sunday to mark the 65th anniversary of the defeat of Nazi Germany. The ship's operator praised the destroyer and its crew for the operation, saying it had been carried out "in the best traditions of the Russian naval mariners." The seizure of the Moscow University was a jolt to the international anti-piracy system put in place along one of the world's busiest shipping routes. The International Maritime Bureau (IMB) said recently the presence of numerous foreign warships in the Gulf was proving an effective deterrent, with 17 attacks there in the first quarter of 2010, down from 41 a year earlier. Heavily armed and equipped with GPS navigation and satellite phones, pirates raked in an estimated 60 million dollars in ransoms last year. 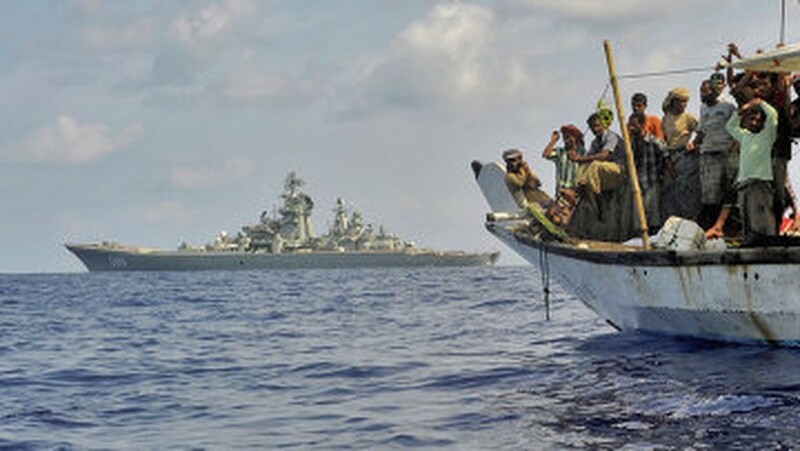 As of late April, Somali pirates were holding 23 foreign vessels and 384 sailors awaiting the payment of ransom, according to maritime watchdog Ecoterra. Mikhail Voitenko, a leading Russian expert on piracy, warned the hijacking of the Moscow University would be far from the last such incident. "Congratulations to everyone," he said in his online journal Maritime Bulletin. "As for the captured pirates, in the grand scheme of things their fate is of no interest. Even if they manage to lock them up, there will be 10 new ones to replace one."